For one thing, the natural gas that we use in our homes is poisoning people in the places where it is extracted. Children in Pennsylvania, for example, are covered in rashes, running into the house with nosebleeds, passing out in the shower due to methane leakage. Respiratory ailments such as asthma are elevated in areas where fracking is occurring. People are suffering from severe headaches, loss of taste and smell, neurological damage, organ damage and so much more. These children and their families and the people in their communities are to me our neighbors. Their suffering is directly connected to the gas that cooks my dinner and heats my home. How can I ignore that? I can’t. Secondly, Maryland currently has a moratorium on fracking, put in place by an Executive Order from Governor O’Malley. This moratorium is set to expire in August 2014. Gas companies are gearing up to frack in Western Maryland, with well over 100,000 acres already under lease, as they await the go ahead from the Maryland legislature. Some of you may be thinking, what’s a little fracking in Western Maryland? It is true that there are citizens who do want fracking in Western Maryland, who want the royalties; who need the royalties. They are willing to gamble and see if they end up with water safe enough to drink and bathe in, air safe enough to breathe. There’s a civil war of sorts happening there (and in communities all across the country), between those who want fracking and those who don’t. So why not let them duke it out for themselves? Well, even if that’s your take, be aware that there’s a lot more going on than meets the fracking eye – industrial plans on a massive scale that will impact this entire state. 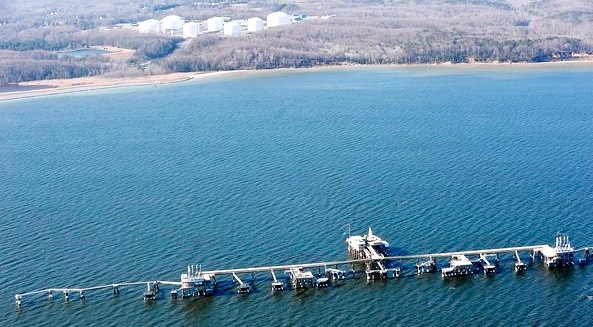 Dominion Resources of Virginia currently owns the Cove Point Liquid Natural Gas (LNG) import terminal on the shores of southern Maryland. They are proposing to invest $3.8 billion to turn this terminal into an export facility. If this happens, it will, without a doubt, let the frack out of the bag. The level of fracking in regional states already full steam ahead (Pennsylvania, West Virginia and Ohio) will increase dramatically if Dominion gets the export go ahead, and fracking in Western Maryland will most likely occur. Existing gas pipelines that run throughout Maryland, many of which are old, will be used at maximum capacity to transport this influx of natural gas. Untold miles of additional pipelines and compressor stations will be built throughout Maryland. These are highly explosive parts of the fracking infrastructure puzzle, and eminent domain (the right of a private corporation to take private property for “public use”) plays a role in where pipelines and compressor stations will go. Additionally, the Chesapeake Bay will be the recipient of massive quantities of toxic waste from the extensive Liquid Natural Gas process, and the air will fill with nasty fumes from bunker fuel spewing from unregulated 1,000-foot international tankers that will carry the volatile liquid gas to Asia. Though Dominion Resources does not yet have approval for the export facility, they have already contracted 80% of their natural gas to India and Japan for the next 20 years. Sweet deal for Dominion. Not so much for us. This natural gas rush is not about energy independence for this region or this country. It’s about where the gas industry can get the most money for their gas, and Asia is where it’s at. They currently pay three times more than we do for natural gas. The gas industry’s focus on exports will result in higher gas prices for us, and yet-to-be-determined areas of Maryland and the region will be left in a wake of ecological, economic and public health devastation. Natural gas isn’t as clean as the gas industry claims it to be. Don’t buy into that. It’s PR at its worst. Adding fuel to the fire, this massive industrial natural gas invasion comes at a time when we are seeing 400 parts per million of carbon dioxide in our atmosphere – a level all nations across the planet agree is dangerously unacceptable in our dire need to curb climate change. Yet methane – a greenhouse gas 20 times more potent than CO2 – continually leaks and is regularly flared into the atmosphere throughout the natural gas extraction process at levels we cannot afford. Furthermore, the LNG export process will pour massive amounts of CO2 into the atmosphere, and that’s before it gets to Asia where more CO2 will be emitted as the gas is converted from its liquid form. What are we doing? The sun is shining! Winds are blowing! The gas industry is doing everything in their power to set up a natural gas infrastructure that will make it that much harder to shift from fossil fuels to renewable energy. There are currently 21 permit requests for LNG export terminals all along this country’s coastlines. And the motivation for this gas rush? It’s green, but it’s not about tending to the living Earth and the natural resources that are essential to life. I’m reminded of the movie “Apocalypse Now,” when Robert Duvall declares that he “loves the smell of napalm in the morning.” I’m hearing the gas industry say the same about methane, though I can guarantee you there’s no gas infrastructure in their backyard. And besides, you can’t smell methane, which makes its presence all the more dangerous. We can do without our overdependence on natural gas. Honestly we can. My home is already powered by wind, thanks to Groundswell, and over the course of a year it is no more expensive than coal-generated electricity. I am checking into an electric stove and solar power to heat our water. Our home is heated by natural gas, and that’s harder for us to change, but I can keep the thermostat down a degree and do a better job of insulating the house. Making these changes decreases the demand for natural gas, and demand rules supply. Stopping LNG export facilities also influences supply. Why not focus instead on doubling Maryland’s use of renewables? We’re already committed to 25% by 2022 and well on our way. Why not commit to 40% by 2025? Why not set an example for the rest of the country? It’s a win-win, especially for our children and future generations. And, FYI, green energy creates jobs. I have met people from Texas, Wyoming, Pennsylvania and West Virginia who are genuinely suffering from the gluttonous, irresponsible practices of the gas industry. Fracking is exempt from all federal environmental law, and the states are woefully inadequate in their capacity to regulate this “Wild West” industry. These citizens are being exploited in horrifying ways. They are our neighbors, and it seems to me we are being asked to respond to their cries with compassion and action. To get involved in stopping Cove Point and ensuring a moratorium on fracking in Maryland, please join Chesapeake Climate Action Network (CCAN). They will send action alerts and other critical information. Town hall meetings on the details of Cove Point will be happening in Baltimore, Howard County and throughout Maryland November 5 through December 3. Please come if you can! *The correct term for fracking is high-volume, slickwater hydraulic fracturing, but it’s a mouthful best served by the use of the word fracking. This entry was posted in Clean Energy, Clean Food, Air and Water, Dominion Cove Point LNG Terminal, Fracking and tagged 40% by 2025, Calvert County, Calvert County Maryland, CCAN, Chesapeake Climate Action Network, Clean Currents, CO2, compressor stations, Dominion Cove Point LNG export terminal, Dominion Cove Point LNG import terminal, fracking, Greater Washington Interfaith Power and Light, greenhouse gas, high-volume slick water hydraulic fracturing, hydraulic fracturing, Interfaith Power and Light, liquid natural gas, love thy neighbor as thyself, Lusby Maryland, Maryland Crossroads 2013 Tour, methane, natural gas, natural gas infrastructure, natural gas pipelines, pipelines, solar energy, solar power, wind energy, wind power. Bookmark the permalink. This article is a very lively read for such a grim topic of greed and pollution that is making children sick today and that will via climate change also poisen their future. The language is magical – we can’t “let the frack out of the bag” . Your insistence that we ask our hearts what tis the ethical way to treat our neigbhors uplifts the whole grim reality of what we know is happening now in Pennsylvania, in so many States, and could be happening here. USGS studies show there is fracked gas deeper than the Marcellus Shale in zones throughout MD. These area, in Montgomery Co , toward the Bay and elsewhere could be fracked once the price get high enough and as technology continues to develop. The answer you stated beautifully is that if we would take all this huge amount of money that would be invested in fracked gas export – the money need to frack, and to build pipelines and compressor stations and to build Cove Point and invest in clean renewal energy for ourselves and our children’s future – we’ll have solar and wind energy enough to live and prosper. IF we don’t… we only have to ask our hearts why we failed to act to protect our neighbors and ourselves and our children. Thanks for this beautiful piece Lisa! I can see the Cove Point plant from my kitchen window and I just shared your piece on my Facebook with my friends and neighbors. I think we are all starting to wake up to what this little bit of extra tax revenue is really going to mean to our more far flung neighbors. Thanks for caring about this issue and keep up the good work! I’m grateful this piece speaks to you, Sue. Many of us are deeply concerned about what your area will be dealing with should the export facility go through. We will be working hard in the months ahead to make sure Dominion Resources doesn’t fly through the approval process, but rather is appropriately scrutinized for the true damage an LNG export facility would cause.